An Introduction to European Intergovernmental Organizations provides an up-to-date and accessible reference to European intergovernmental organizations other than the European Union. The EU is so dominant that people often overlook the multitude of older and newer, smaller and larger intergovernmental organizations rooted in the history of contemporary Europe which continue to help shape its future. The specialized character of these organizations adds value to cooperation in Europe as a whole, creates permanent channels of communication regardless of EU membership and allows the possibility for non-European involvement through organizations such as the European Bank for Reconstruction and Development and NATO. It also allows sub regional groups of states, such as the Nordic countries or the Benelux countries to exist and express their own identity via their own organizations. 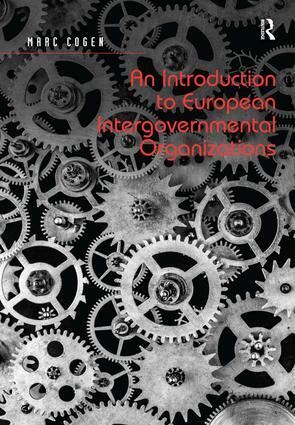 This book looks at the history of Non-EU organizations, their decision-making characteristics, membership policies, legal powers actions and interactions with each other and the European Union. A uniform scheme of analysis is used to make European intergovernmental organizations comparable and by studying them we gain a deeper understanding and insight into European affairs. Marc Cogen teaches currently international and European law at Vesalius College in Brussels. He has published on general international law and key issues of European cooperation. He was a consultant and advisor of several governments.